Bucket #3. Or #4, depending on if you count the Heather Ross bucket. So, number three or number four. You decide. 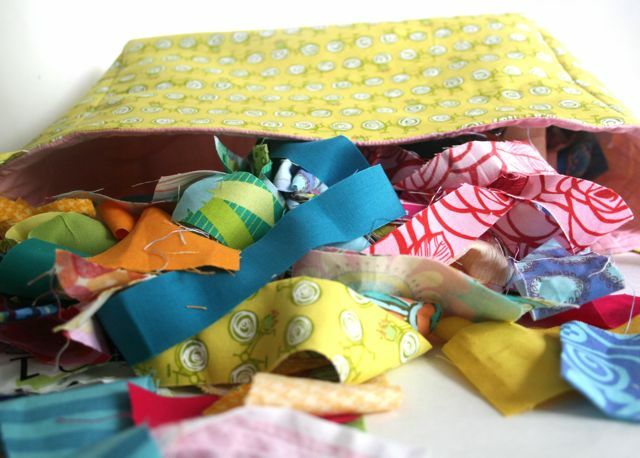 This one holds all the ittiest bittiest pieces, the ones that weren’t 9″ x 9″ (not scraps, folded and put away with the fat quarters) and weren’t between 8″ x 8″ and 4″ x 4″ (the circles for the yo-yos and the pieces that became the hexies, respectively) and weren’t 2.5-ish” x 2.5-ish” (the squares for the postage stamp quilts). So, mathematically, these are all smaller than 2.5″ in one dimension (or both). These are the pieces that most folks toss out and figure are too little for much of anything. 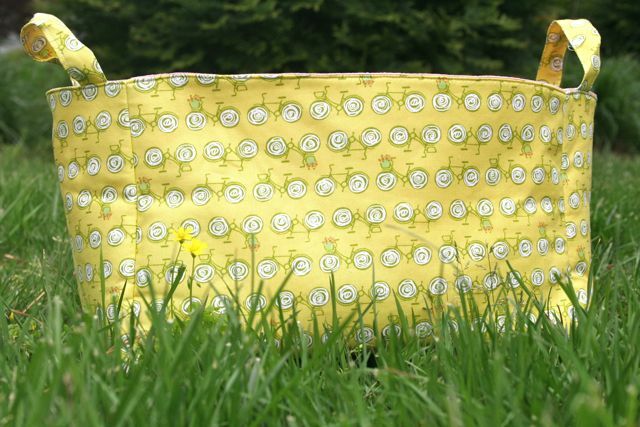 For me, once I met the covered button, I didn’t think there was such a thing as a scrap that was too small–I mean, have you seen how little fabric it takes to make a super cute covered button? You can hardly throw anything away once you board that ship. It’ll sail right off to China with you. Or Buttonland. Which isn’t really a place, but you see where I’m going here. 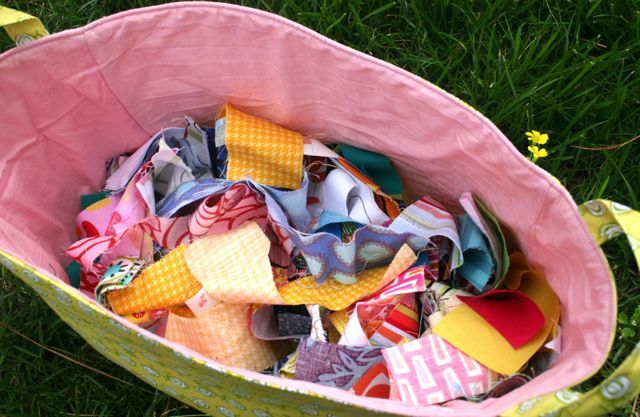 Ever since I saw Rachel’s Bottled Rainbows quilt-along start up, I’ve been thinking in a back-of-my-head kind of way that it would be a great way to use up some of those really fabulous scraps from fabrics that I love too much to toss out even the bittiest bits–like any little Good Folks snippets or Far Far Away bits. Things that are so delicious that it feels disloyal to toss them out somehow. 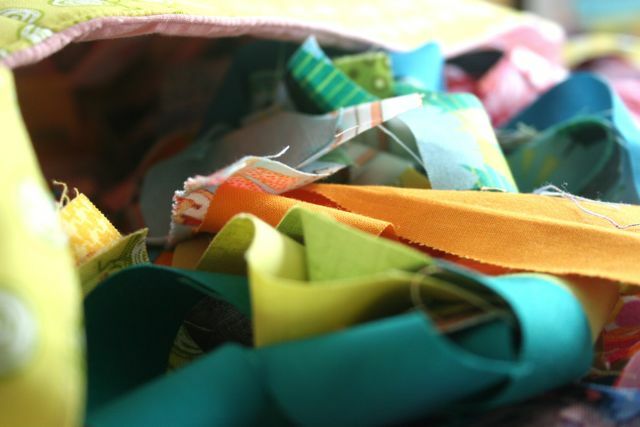 Ticker Tape Quilts are built gradually by adding small bits of fabric to a quilt sandwich as you go: lay out the quilt backing, the batting and the top (which is also the background fabric) and baste together. 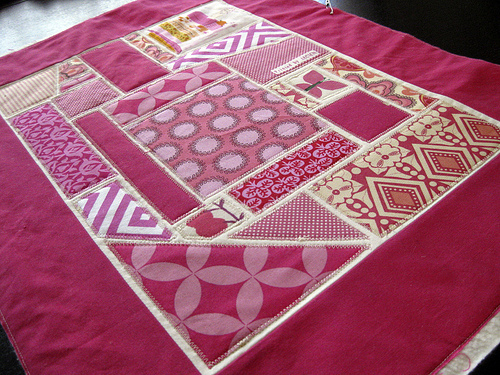 Place each fabric bit where you’d like it, and stitch through all the layers, quilting as you go. Voila! Ticker Tape Quilt! If you’ve got a hankerin’ to make you one of these, I suggest skipping on over and joining in the fun. I mean, check out what other folks are already posting on the Flickr group! As for me, I’m planning to make a few more projects to let my mini-scrap variety get really robust, and then dive right in. Oh, hey!! Maybe my Tony Danza portrait quilt needs to be a ticker tape quilt!! Gasp! I am the Boss, yo. I’ll look forward to seeing what your ticker tapes become, Deborah. Thanks for sharing the love! 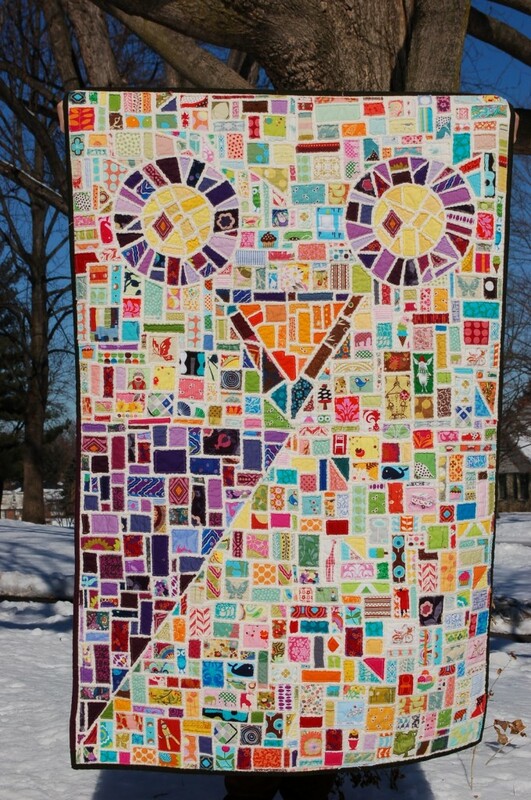 I’ve never done any quilting, but those are so cool! 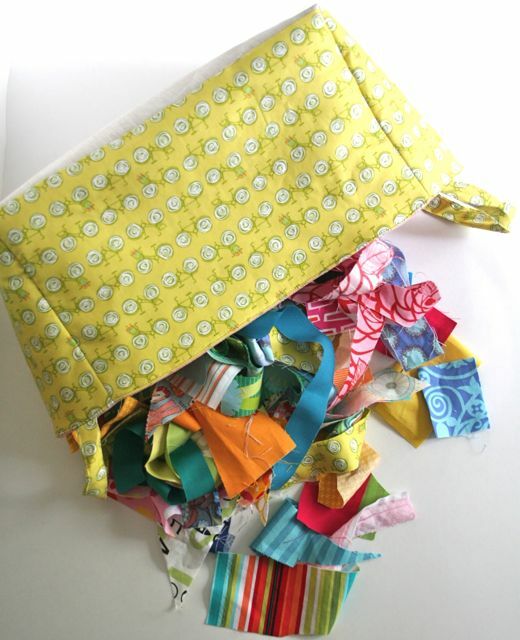 Plus, I hate throwing away scraps of any fabric. What a perfect way to use them up! 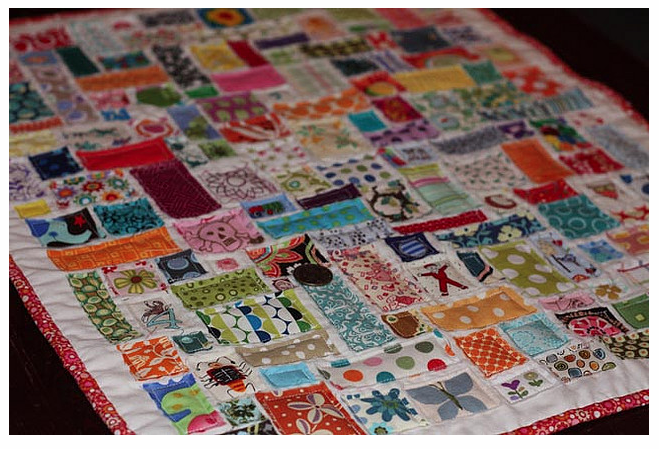 Thanks for the shout-out on my ticker tape quilt. They are so lovely to make – I have an awful hankering to throw my hat into the Bottled Rainbows party, albeit a bit late. 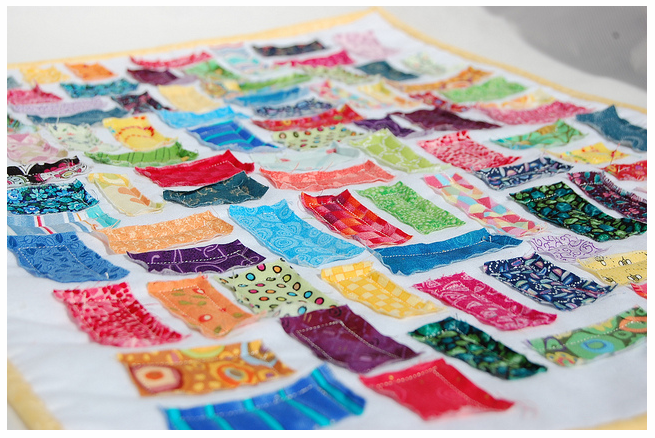 pretty sure it was Amanda Jean of crazymomquilts who coined the ticker tape quilt. pretty darn awesome.